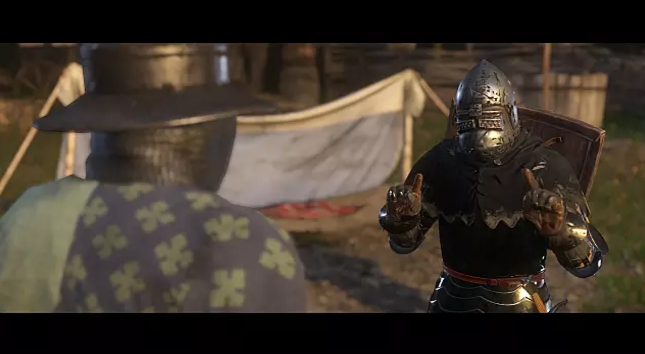 Learn where to find and how to parlay with Sir Wolflin of Kamberg in this guide to the Robber Baron side quest in Kingdom Come: Deliverance. 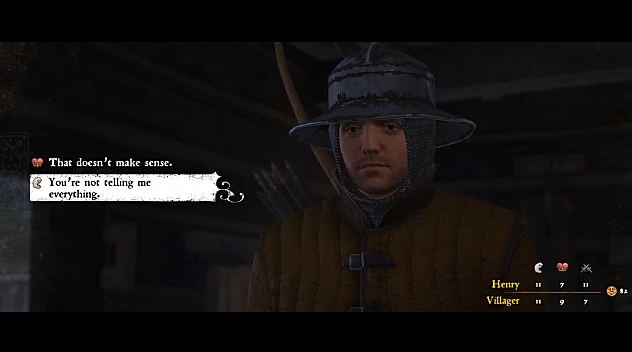 The Robber Baron side quest in Kingdom Come: Deliverance has built quite the reputation for itself. Much like the many quests before it, you're going to need brains, brawn, and the mouth of a bard to maneuver your way out of this mess. Whether it's the save corrupting bug that plagues your game after completing it or the difficulty parlaying with Sir Wolflin of Kamberg, you’re sure to be met with some difficulty. Before jumping in, it's important to note that you can work around the Robber Baron bug by saving the game before reporting back to Sir Hanush. According to this Kingdom Come: Deliverance Reddit thread, it's only the save files after the quest that are affected. You may want to wait to complete the quest until the bug is fixed or save prior to speaking with Hanush so you can refer back to that file if you experience any problems. Talk to Lord Capon after completing Next to Godliness. He’ll tell you that Sir Hanush has summoned you both but before you can meet with him, Capon will request that you change into some nice clothes. Head to his chambers and put on the outfit he has tucked away in his chest then report back to complete the Clothes Make the Man side quest. Keep the nice clothes on for the Robber Baron quest because you’ll need the boost in Charisma. Purchase a Bard potion from the Apothecary because it’ll come in handy for parlaying with Sir Wolflin. 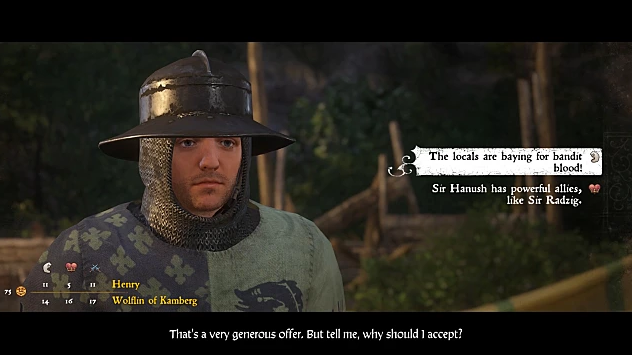 When you finally meet with Sir Hanush, you’ll watch a cutscene where Henry and Lord Capon are being reprimanded by Sir Hanush for their wild night at the Rattay baths. He’ll then assign you a task: Find and parlay with Sir Wolflin of Kamberg, a bandit that has been stirring up trouble in his fiefdom. This will initiate the Robber Baron side quest. Outside in the courtyard, talk to Captain Bernard. You will ride alongside him, Lord Capon, and his soldiers to the camp from The Prey quest. Once there, speak to the Captain again and he’ll ask you to scout two nearby farms that were raided by Sir Wolflin to find out their whereabouts. Visit the farm in the south first and offer the woman 3 bandages for her husband. She’ll reward you with 70 Groschen for your generosity. She’ll advise you to follow the path of blood but instead, travel to the farm up north. Speak with the lady of the farm because she’s the one who has the most information about Sir Wolflin and his bandits. She’ll pretend to know nothing at first but make sure to say that you don’t buy her story. She’ll confess the truth and even take you to the location of the camp if you ask her. There are two choices you can make: fight the bandits on your own or speak to Captain Bernard about what you saw. The best bet is to head back to the camp and talk to the captain unless you’re extremely confident in your combat abilities. These bandits are nothing to sneeze at. Tell Captain Bernard there’s about 10 bandits at the camp and use your high Charisma to convince him to negotiate with Sir Wolflin. If you’re successful, He’ll provide you with a waffenrock with the Rattay coat of arms and ask you to unequip your weapons before trying to parlay with Wolflin. Ride back to the location of the bandit camp, take the Bard potion and then walk up to the guard. He’ll take you inside the camp to talk to Wolflin. Ask him about the story Captain Bernard told you and find out as much as you can before telling him that he must leave behind all his loot and 3000 Groschen. If your speech skill is high enough, you can convince him by saying You have no quarrel with Hanush. If not, he’ll reject your offer and you’ll have to lead Captain Bernard and his soldiers to the camp for a battle. 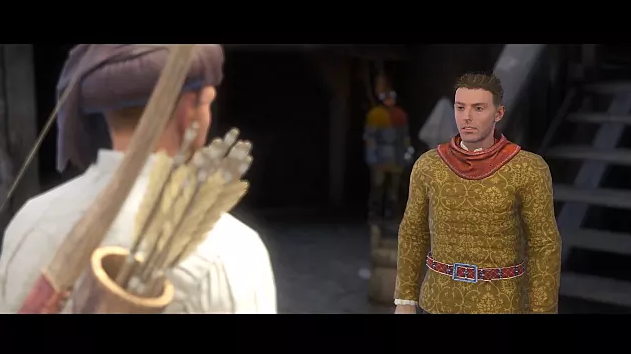 After the battle or successful parlay, speak to Captain Bernard and he’ll ask you to head back to Rattay to tell Sir Hanush what happened. But before you do that, remember to save your game! After speaking to Sir Hanush, you’ll be rewarded with a Magdeburg cuirass and the Robber Baron quest will be complete. You are reading "Kingdom Come: Deliverance Robber Baron Guide".